Get the humorous word play in the title? Wrap-up, meaning both wrapped candy as well as finishing up a project. Now you know why I don't do stand-up. 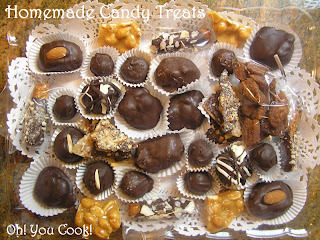 Click on the following photos to get recipes for the candies in the tray above. Included are a few extra goodies tossed in, no extra charge. Because, Dear Reader, you are my favorite.